The fifth TimeSpace, and room, recounts the contradictory female role prescriptions and the basic gender-political consensus among women in Germany. With their demands, they shook up the truth claims of male politics and patriarchal interpretations. 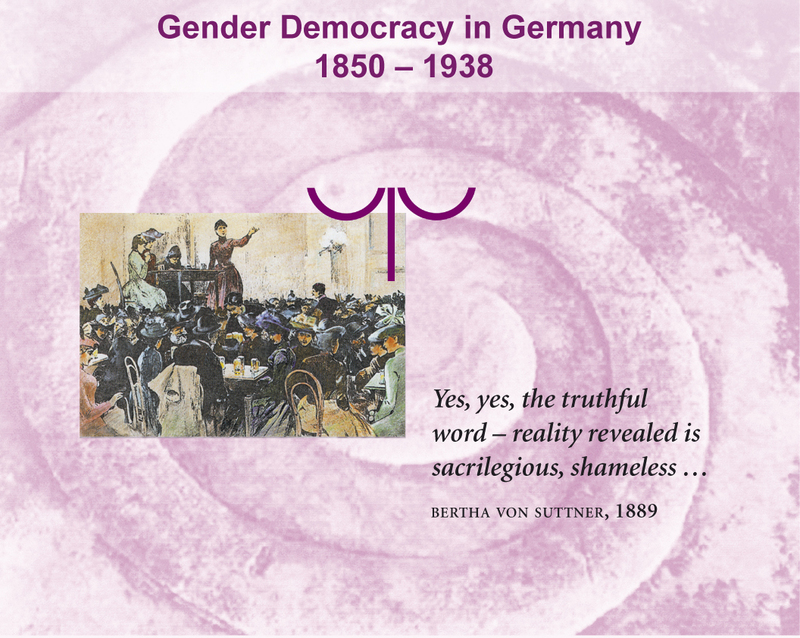 During the reign of the emperor, the Weimar Republic, and the NS regime women were aware of their political responsibility for living and surviving. The scale symbolizes fair inclusiveness - in spite of all patriarchal strategies of exclusion. The women of the women's movements in this bourgeois era represent women's claims to gender-democratic relations within and outside the private sphere. The wooden table by Carl Koch from 1890 conveys a lively impression of women's determination to participate in political life.